Sri Rabindra Kumar Mohapatra, MBA/Finance, FCMA, with a rich 25-year experience in the field of finance in India and abroad, is now working as Joint General Manager of Finance at the IRCON INTERNATIONAL LTD, New Delhi. R K Mohapatra (born 1963) is an Indian author, known for his work on financial planning and retirement planning for individuals. R K Mohapatra, describes the topic of financial planning for an individual along with future growth for financial product in India, which also reflects an investor’s perspective on handling his or her hard-earned money carefully through proper investment planning. He has authored two books, “Retirement Planning: A simple guide for Individuals” and “Investment Risk & Growth: A guide for Investors about Investment Vehicles”. His contribution to social and religious fields is as commendable as his work related to finance and accounts. The author has a passion for writing articles in newspapers, blogs, on goodreads.com, medium, and spreading knowledge through the online media. The author always welcomes suggestions and comments from readers. Readers may contact the author at rabindra.k.mohapatra@facebook.com or rk.mohapatra.as@gmail.com. Retirement Planning: A Simple Guide for Individuals by RK Mohapatra is a good book on retirement strategies and planning, along with solid financial management tips. Retirement Planning is specifically written for investors and people who would be investing in India. The book is divided into several chapters on topics including budgeting, importance of long-term financial planning, meaning of basic financial tools and terminologies, mutual funds and expense ratios, stocks, commonly used financial indexes and benchmarks (Sharpe ratio, alpha, beta, etc. ), calculation of interest vs. inflation, insurance, as well as information on specific funds in India such as PPF. All of this and more is divided neatly into chapters so that information is easily to find and well categorized. This is an excellent book on individual and personal financial planning. What I really liked about the book is the manner in which terms and strategies are simply explained so that they can be easily understood by a lay person. Another huge advantage is the real examples and analyses provided throughout the book that show how to calculate expenses vs interest rate over different periods of time for different funds. All of the examples and information are based on Indian government rates and funds available in India. However, for a person investing elsewhere this is still an excellent insight into overall retirement planning and strategies as the basic principles remain the same. An excellent book written in a very easy to understand manner that I would recommend to readers of any ages. It is never too early to start saving. It is good book for personal financial planning and Retirement planning. One must read this book its worth reading. I have not accross any book with befifit after retirment. One can plan his retirement life. THINK FOR FUTURE, THINK OF RETIREMENT !! In the present day scenario, everyone needs to be educated on the various essential aspects of financial planning and especially retirement planning. The book, ‘Retirement planning a simple guide for individuals’ will enable you to make your own strategy by calculating the numbers of amount you need at retirement and set realistic goals for need of your family, by investing in the right product, at the right time, at right place which will generate the required amount over a span of period, and help you in fulfilling your dreams. The book explains with concise and concrete examples, which can help you to understand about the pre-retirement stage (accumulation period) and post-retirement stage (distribution period). The graphical presentation and analytical calculation in tabular form of different investment products enables the perspective investors towards setting his/her retirement goals and visualize the future life. The key objectives of this book to make awareness to people how they can live like a king for the rest of their lives by making meaningful decisions in the pre-retirement stage. All of us have the potential to take concrete decisions and the importance of focusing on specific goals to achieve them in time. Investment through SIP ensures discipline investment regardless of the volatility of the market movement. This helps an investor average his cost through market cycles and create a big corpus to achieve his or her goal without taking too much risk in the long run. Mutual funds help an investor to create a good portfolio mix due to its various categories of fund such as: large-cap funds, multi-cap funds, mid-cap funds, hybrid funds and debt mutual funds. Equity funds have greater risk of capital loss in comparison to hybrid/ diversified funds. One can invest a fixed amount in a mutual fund regularly such as daily fortnightly, monthly and quarterly in SIP. In order to satisfy your need you create huge corpus in long-run with clear mission and objectives by investing your hard-earned money in different assets and generate good return in volatile market. A book with concrete examples, very precise and thoughtful. R K Mohapatra’s book “Retirement Planning-A simple guide for individuals” is well written and easy to understand. The author pens down the real-life example of investment products and its implication in respect to risk and returns of financial products, market returns, market behavior, and impact of inflation, taxes, insurance, estate planning and more. This book inspires me to invest a very small amount in every month through SIP route in order to get huge corpus in long –run for retirement. This is a comprehensive book for all people, who are in pre-retirement stage as well as post retirement stage. It helps you to choose the right investment products for building your retirement corpus and mapping out for your post retirement monthly expenses. It’s a book with concrete examples, very precise and thoughtful. Retirement Planning: A Simple Guide for Individuals by R.K. Mohapatra is a resource that anyone can use and benefit from in helping them to plan for the future. This book helps individuals for making their investment and creates a financial backup by retirement that would let them to lead the rest of the life with financial security and pride. In my view, this is a very useful book and must read book for all. 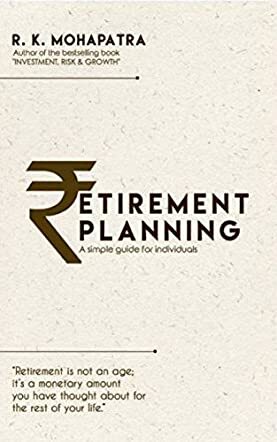 In this book, MR R K Mohapatra sir break down the process needed to plan, implement, execute and ultimately enjoy a comfortable retirement..
Due to increased life expectancy, with people living 20-25 years, even more, after retirement, it is imperative to ensure that your finances are in a good shape when you retire. So, in this book Mr R K Mohapatra talk about the most common mistakes that people make while saving and investing for life after retirement. For good measure, author also discuss how these mistakes can be corrected through timely action.